Five years after winning their last title, Los Blancos reached their third final of the 1960s but this time emerged victorious with a squad solely composed of Spanish players. Four players posed as the Beatles for publication Marca and so the team became known as the ye-ye team—to badly paraphrase the chorus from She Loves You. The tournament marked the end of Ferenc Puskas’ stellar Real Madrid career where the Hungarian amassed a remarkable 242 goals in 262 games—of the all-time top 10 record goal scorers only Cristiano Ronaldo has a better strike rate. There was a considerable amount of animosity between Real and Feyenoord as the two met in the preliminary round. The first leg was temporarily halted after a vicious tackle by Real’s Miera on Feyenoord’s Moulijn provoked a near riot. Moulijn was so incensed that he and his team mates chased after his opponent, with officials, stewards and even the police attempting to restore order. There was no such trouble in the second leg as Real ran out 5-0 winners at the Bernabeu with Puskas notching four times—his last goals in the European Cup for Real Madrid. Real reached the semi-finals where they met the formidable and reigning two-time European champions Inter. Without the household names of Di Stefano and Puskas Inter were considered favourites but Los Blancos’ side contained a nucleus of home-grown talent who collectively managed to squeeze past the holders 2-1 on aggregate and into the final. After beating Benfica 8-3 in the preceding round, Manchester United took on Partizan Belgrade in the semi-finals. 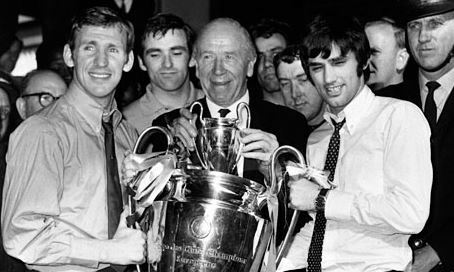 Matt Busby had rebuilt his side since the horrors of the Munich Air Disaster, which revolved around future Ballon d’Or winners Bobby Charlton, Denis Law and George Best but the club’s return to Belgrade was a haunting experience and the away leg resulted in a 2-0 defeat. Without an injured Best in Manchester, the Red Devils could only win 1-0 and so Partizan would play Real Madrid in the final. The final was goalless at half-time but Partizan had struck the crossbar and had largely been in control of the match. After the interval the Yugoslavs continued where they left off and captain Vasovic headed in a corner after 55 minutes which prompted Real into belated action. Los Blancos threw caution to the wind and played without fear, even if they were venerable to counter-attacks, but fortune favoured their tactic as they equalised and then Serena scored from 30 yards to win the Spaniards an overdue sixth European Cup. Following England’s 1966 World Cup win English champions Liverpool strived to improve on their previous semi-final achievements but they hit a road block in a Johan Cruyff-inspired Ajax. The Dutch champions beat Liverpool 5-1 on a foggy night in Amsterdam and a draw at Anfield was more than sufficient to topple the English giants. Having been eliminated by Real in the previous year, Inter were granted the opportunity for instant revenge in the quarter-finals. Inter were ruthless as their now-famed catenaccio tactic ensured two clean sheets. Real’s supporters were so exasperated that in the second leg at the Bernabeu (which they lost 2-0) they jeered the players and one even threw a live chicken at Gento after he missed a seemingly easy chance, while another ran onto the pitch wearing a bullfighting cape pretending to play imaginary passes to the players to demonstrate which direction the goal was! Scotland’s champions Glasgow Celtic had Jock Stein at the helm and upon signing for The Bhoys in 1965 he set about winning trophies immediately. After winning the Scottish title in 1966 Celtic had entered the European Cup but European football had not distracted them from their domestic duties as they went on to win the domestic league and both Scottish cup competitions. In Europe they met Yugoslavs Vojvodina in the semi-finals, who had conquered Atletico Madrid. A last-minute tie-winning Billy McNeill goal meant Celtic became Britain’s first representatives in a European Cup final. Stein relied on local talent and the vast majority of his players had been born and raised within a 30 mile radius of Celtic Park. The Bhoys played a fluid attacking game based on a 4-2-4 formation with the wingers encouraged to attack the opposition fullbacks and deliver plenty of crosses into the opponents’ penalty area. By contrast Inter’s approach was to grind down the opposition by playing a dull and defensive, yet effective style which had prevailed in Serie A and against Europe’s finest teams. Despite missing Jair and Suarez for the Lisbon final Inter remained favourites but that did not deter 12,000 Celtic fans from making the journey over to Portugal. It was important given Inter’s style of play that Celtic did not chase the game but their worst fears were realised when Mazzola converted a penalty in the first 10 minutes of the match. However, without Suarez to instigate, Inter’s counter-attacking threat diminished which resulted in Celtic’s fullbacks aggressively supporting their wingers, the central midfielders pressing their opposite numbers and Celtic’s two centre-forwards skirmishing with Inter’s three centre backs. With no way to alleviate the Glaswegian pressure (Celtic had 42 attempts on goal compared to six for Inter) Gemmell and Chalmers eventually both scored for the Lisbon Lions and Celtic held on comfortably to become the first non-Latin team to be crowned European champions. Celtic were fully deserving of their victory and the result marked the end for catenaccio. Although the tactic had been effective, it had few admirers outside of the blue and black half of Milan. In the space of two years Britain had firmly broken the chain of serial Latin success in club and international football. England had won the 1966 World Cup and Celtic were flying the flag for Scotland as European Cup holders. The Bhoys defence of the European Champions Cup however was brief as Celtic fell at the first hurdle against Dynamo Kiev. Manchester United, who had won their second English championship in three seasons, embarked on another European campaign with an added incentive—the final would be held at Wembley stadium, the scene of England’s 4-2 win over West Germany. For the first time in the competition’s history the away goals rule applied which meant in the event of an aggregate draw the opponent with more away goals would be determined the winner. The semi-finals provided a powerhouse line-up where a Eusebio-inspired Benfica beat Juventus 2-0 in Portugal and then 1-0 in Turin to reach their fifth European Cup final in eight years. In the final they would line-up against United who had narrowly beaten Real Madrid 4-3. A first leg 1-0 win in Manchester was deemed insufficient as many thought United would be comprehensively outplayed in Spain. A 3-1 Real lead at half-time confirmed the experts’ fears but then George Best set up two goals, the last for Bill Foulkes, survivor of the Munich Air Disaster and oldest member of the Red Devils, to slot United into the final. With so much emphasis on the attacking threat of Best and Eusebio both players were man-marked which made for a dull first half. In the second half, Charlton found a pocket of space to open the scoring. Jaime Graca equalised which gave Benfica the ascendancy and man of the moment Eusebio was sent racing clear in the last minute but United goalkeeper Alex Stepney refused to commit himself early and called Eusebio’s bluff as the Black Pearl hit the ball straight at the goalkeeper. The final whistle sounded and United had been given a reprieve, or perhaps Guttmann really had cursed Benfica, because within the first 10 minutes of extra-time Best, Charlton and Kidd each scored to wrap up the final as United became England’s first European champions. Political tensions had spilled over in Europe so UEFA attempted to defuse any sporting diplomatic rows by separating Western and Eastern European teams in the early stages of the tournament. The problem being that the draw for the opening rounds had already been made and in amending the schedule several Eastern European clubs were outraged. They refused the changes and withdrew from the competition which left several teams with byes in the earlier rounds. In a battle of the former champions Milan eliminated Celtic 1-0 on aggregate in the quarter-finals. At the same stage, Johan Cryuff’s Ajax beat Benfica 3-0 courtesy of a replay and then beat Spartak Trnava in the semi-finals to reach their first final. For holders Manchester United a 2-0 deficit from their first leg proved too steep a hurdle to overcome against Milan. Although city rivals Inter were famous for catenaccio, Milan utilised the same tactic to great effect in Manchester and despite having the majority of possession the Red Devils found it difficult to break down their Serie A opponents. The Rossoneri were expected to stifle the young and exciting Ajax side, grinding them down with ‘negative football’ tactics. However, Milan surprised many as they attacked from the outset and quickly established a 2-0 lead through Prati. Vasovic gave the Dutch hope, and in doing so became the first player to score in a European Cup final for different clubs, but Sormani kept the momentum Milan’s way with a third goal. Prati then completed his hat-trick as Milan won 4-1 to lift the European Cup for the second time in their history and importantly match their cross town rivals Inter. Tagged as: AC Milan, Ajax, Bobby Charlton, Celtic FC, Eusebio, Ferenc Puskas, George Best, Jock Stein, Lisbon Lions, Manchester United, matt busby, Real Madrid C.F.